Once the customer is selected the customers credit information will be displayed, If the credit limit background is red this means that the customer is over the credit limit or has unpaid invoices beyond their terms. The user must have the security setting User/Customers/Can See Customer Credit Info. *Note the red ribbon message. This means that the customer has notes that should be read. PO Number – Adds the customers PO number and if the customer is set to ‘Require PO’ in their profile then the user will be warned that a Purchase Order number is required. The order can then be saved without a PO but cannot be processed, shipped or invoiced until a PO number has been entered. Misc Field – This field can be labeled as required in company settings -> Variables. Whatever is in this field show in yellow. In the example the field is called “Important Info. *Note: Use this field wisely because it show on every order. Salesperson – The salesperson can be entered if the sale is to be tracked. There is a company setting, that if turned on, the salesperson must be added to the order before saving it. If the customer has a salesperson attached to their record it will populate this field with the salesperson as you add the customer to the order. There is another company setting available that will populate the order with the user code if it matches the salespersons code. Users need security to be able to change the salesperson code on an order. Territory – The territory can be entered if the sale is to be tracked. There is a company setting, that if turned on, the territory must be added to the order before saving it. If the customer has a territory attached it will populate this field with the salesperson as you add the customer to the order. Ship to – Users can select from any shipto attached to the customer. When using the lookup the user can click on ‘All Addresses’ and they will be able to select any customer in case the order needs to be drop shipped elsewhere. Ship Via – Select from any shipping carrier that has been previously set up in Edit/Ship Via. The user can also free type in the ship via description field if using a miscellaneous shipper. Contact – This area is for adding the contact of the person that gave you the order. You can free type in the name, Phone, Fax and email. You can also use the lookup to select the contact information for any of the customers main or shipto contacts even if the shipto is not on this order. Order date – Usually the day that you created the order but it can be edited to any date. Required Date – The date that the customer want the goods. This is useful on the sales order list because the user can sort by this date column to see what needs to be shipped today. Repeat – This option is available for standing orders. The user can select from daily, weekly, monthly, yearly or custom. If custom is selected they can choose any non standard repeat cycle using one of the calendar options as a start. When a standing order gets invoiced the invoice date will automatically be advanced by the repeat cycle. The user can set a filter on the sales order list for all standing orders due this week and simply highlight all of them and print or email invoices to the customer. 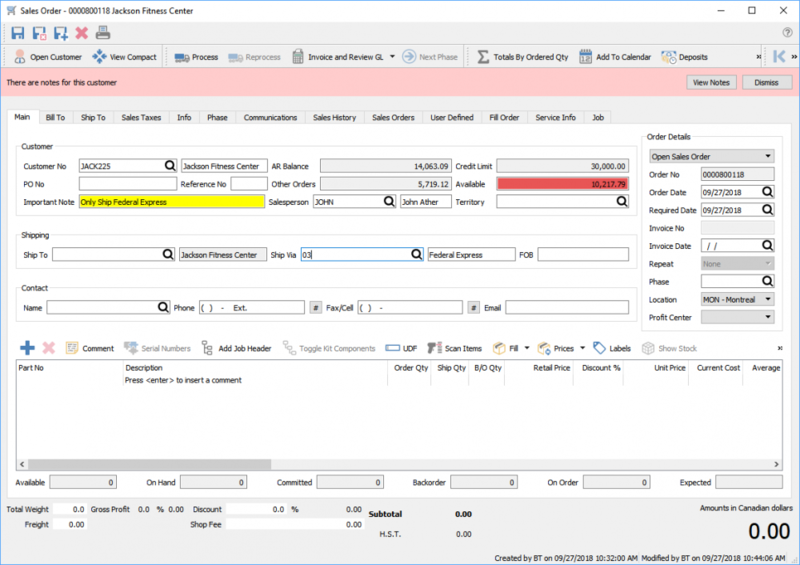 Phase – Custom phases can be added to a sales order. Preset phases can be set up under Edit/Phases or on the sales order phase lookup dialog. Each phase is given a code, a description, a report template and a next phase. If a report template is added to a phase and the order is moved to that phase, any report that has that template name will be presented for printing. The next phase needed is triggered when the user clicks the ‘Next Phase’ button on the sales order list, or from inside an order and then the order will be moved to the ‘Next Phase’. This feature is very useful for user that need their order to go through a custom set of procedures. Location – If turned in in company settings this filed will appear. Profit Center – If turned in in company settings this filed will appear.